Reclaiming residential streets, Dutch street design, and why this REALLY REALLY matters. This might be the most important blog post I write on urban design – but it’s also been one of the most difficult. I want to demonstrate how to look at a quiet Dutch residential street, and to see what isn’t there – and to be amazed by that. Obviously that’s not an easy thing to do. If you haven’t guessed this one is going to be all about the renovation of the Widcombe Subway. The barriers have now been removed. This is a renovation that locals in the area did not want and one that was imposed on them by traffic modelling and air pollution. Yes, Cllr Clarke suggested a level crossing would create air pollution. Oh and despite there being a level controlled crossing on the west of the roundabout. I have emails about this going back to 2016 where people were asking for a level crossing. The decision to renovate the 1970s subway predates the golden era in transport policy brought about by Cllr Shelford and is the last gasp of the dark ages of Cllr Clarke (a.k.a Mr 30mph). You cannot paint over tight corners and very confined space to make it better. It’s simply a horrible shared space route that we should have just filled in and left to rot. What they should have built. The real issue with Churchill Roundabout is that it’s horrible to use and the south exit is an RTC black spot. I drew this proposal and I realised last night that by opening up one of the arches you could have created a very wide route into the city centre rather than the narrow path through the bridge. It needed imagination and a willingness to prioritise walking, cycling, and tackle car dependency. Instead we, the people of Bath, are sacrificed at the god of vehicle traffic flow. As a side note, Cllr Mark Shelford has announced he is running for Police Crime Commissioner. This is hugely disappointing as this is likely to mean, should Mark retain his ‘seat’ and the Conservatives win in May, he is likely to step down as Cabinet Member for Transport . No matter your colour be it red, blue, green, or yellow, it is the individual councillor’s views and capabilities that make the difference. Mark has been excellent and very capable but his predecessor was really really really bad. We are *still* suffering from his predecessors handy-work and he has left a legacy of issues that still need fixing. Mark’s legacy, particularly beginning the introduction of the Oxford Walking and Cycling standards should stand us in good stead for decades to come. A driver, cyclist, and pedestrian walk into a bar. The driver takes 10 cookies and says to the pedestrian "watch out or the cyclist will take your cookie"
…nobody noticed the person with a disability couldn't get into the bar in the first place. For anyone that has joined Cycle Bath’s Facebook Group, you will be intimately aware of the work of Bath and North East Somerset’s Public Rights Of Way (PROW) team around Fieldings Bridge and ongoing river path improvement from Locksbrook to The Boathouse pub. For those unfamiliar here’s a quick history. For the last 10 ish years the owner of the car park next to Fieldings Bridge has been asking the PROW team to sort out the correct path and prevent people crossing the car park. Bath Spa University bought the Herman Miller building and boarded up the one access route from the river to Fieldings Bridge while they redevelop the site. The PROW team then installed a very poor set of concrete steps from the river to the bridge despite numerous calls from people and organisations for a connecting level path. Car Park owner now has anyone with a push chair, mobility scooter, bikes, anything wheeled, using the car park and decides enough is enough and fences off the car park. After much gnashing of teeth and councillor intervention (Thank you Cllr Doherty!) PROW team eat humble pie and install a connecting level path. The council approves a significant number of student accommodation to be built on Lower Bristol Road, then the Lidl Retail Park, and the upcoming Bath Spa campus. It also helps develop and build the Two Tunnels which is a major tourist attraction and heavily promoted by Visit Bath. It’s also the beginning of National Cycle Network Route 244 and connects to NCN 4, y’know the Bath to Bristol Railway path and all the way to London. The council also publish an award winning Water Study that specifically highlights the issue of overcrowding on this bridge, how much worse it has become and how this bridge urgently needs replacing. There have been reports of a number of incidents of people cycling aggressively across Fieldings Bridge and colliding with people walking over it. That’s really sh*t behaviour. There have also been incidents of people blocking people cycling over the bridge and accosting them. PROW team removes the advisory Cyclists Dismount signs and replaces them with No Cycling signs. Job Done. Well but forgets to put one on the new level connecting path between river and bridge so any cyclist coming from the river has absolutely no clue that they are now illegally riding over a bridge. So now NCN 244 broken. The Two Tunnels Circuit is broken. Any disabled cyclist in a hand cycle can no longer use the bridge. I spoke with Visit Bath yesterday and told them they might need to inform any tourists about this. Sustrans are preparing a response. Notices goes out that the PROW team are going to be upgrading the footpath as it is unusable. Being a nosey busy body, I dive in and find out that the new bitmac path width will be 1m wide all the way as there are bits of the path that are that narrow. In parts the path is currently 2.5m wide and heavily used. You can see this due to the usage pattern. In fact I’d say most of it is 2m wide given the amount of smooth clay either side of the new 1m wide tarmac strip. I requested that, at a minimum, passing places are put in to allow two mobility scooters to pass each other and am assured that intermittent passing places will be installed. No specific intermittent passing places are being installed. The only widening is done where there is a river feature or bench. It’s a nightmare for mobility scooters with 100s of metres without a passing point with a good chance of one of them falling towards the river off the raised tarmac path. The PROW team have designed in immense conflict on an exceptionally busy footpath that is impossible to use by somebody in wheelchair. Mobility scooters could not even turn round on it. We really do have a PROWblem! So as far as I can work out, the councils PROW team has an immense hatred of cycling and makes sure as little wheel friendly new infrastructure as is legally possible put in place. This shafts wheelchair users, mobility scooters, push chairs, disabled friendly trikes, hand cycles etc. but hey at least you’ve tried to prevent those nasty bi-cyclists from using the FOOTpath. There is something really wrong with a department that has such a clear anti-disabled bias operating within it. The PROW team should be all about creating wheel friendly infrastructure. Its core principle should be about tackling the social model of disability as part of its work. The social model of disability is a way of viewing the world, developed by disabled people. The model says that people are disabled by barriers in society, not by their impairment or difference. Barriers can be physical, like buildings not having accessible toilets. Or they can be caused by people’s attitudes to difference, like assuming disabled people can’t do certain things. The social model helps us recognise barriers that make life harder for disabled people. Removing these barriers creates equality and offers disabled people more independence, choice and control. Building 1m wide paths, only building steps, refusing to build level paths, and putting up No Cycling signs on an overcrowded bridge caused by planning decisions made by their own council, shows a department with some very big problems and completely out of touch. I would strongly suggest there is a need for accessibility training. It should not be for the likes of Cycle Bath to point out the obvious need for 4 season wheel friendly infrastructure and the, sometimes, life changing benefits to people with disabilities. I realise this is late notice but the forum is meeting today, Tuesday the 8th of January, 5.30pm to 7.30pm in the Kaposvar Room, Guildhall in Bath. Please attend if at all possible and if you want to be kept in the loop about upcoming ATAF meetings I would suggest emailing Justin_Reeve@bathnes.gov.uk who will add you to his email list. Disturbing news this morning: more people died on a bike than in a car in the Netherlands in 2017. A total of 206 people died on bicycles and 201 in cars. This is the first time that ever happened. The figure for cycling deaths is also the highest in 11 years. The fatality increase is completely male. The number of killed men went from 125 in 2016 to 148 in 2017. For women the total decreased a little, from 64 in 2016 to 58 in 2017. And yet, when you look at deaths per cycled kilometres, then cycling is becoming safer, not more dangerous. More cycle fatatilies in the Netherlands while cycling is becoming safer. 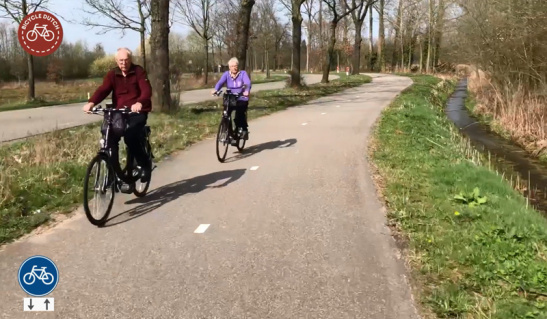 The elderly account for three quarters of the cycle fatalities in the Netherlands. Utrecht is reconstructing the streets directly around the historic city centre. These streets, alongside the former city wall and moat, were once supposed to become a four lane main road. For that the water would have disappeared. That never happened at this location but the streets did become a main route for motor traffic for decades. Now the streets have been designated as a main cycle route around the city centre. The design of the streets is being changed accordingly. The second stage of this project has just been finished and a third stage is under construction. The reconstructed Maliesingel in Utrecht has first and foremost become a main cycle route. The area is now also an attractive urban space where people may want to linger longer. Bath and North East Somerset announced consultation on the Kensington Meadows, an area of Bath that runs parallel to London Road between the road and the river. What is clear is that they asked the current users of the meadows what they wanted. People that avoid the meadows due to being physically unable to use the meadows really got short shrift. I hate this idea that everyone shares the same responsibility. As has been shown by West Midlands Police, most collisions between a person cycling and and a person in control of a motorised vehicle is the fault of the driver. The use of the term ‘accidents’ has been banned by the British Medical Journal as there is always a root cause and don’t get me started on “Share with care”. Something stolen from the towpath scene and more appropriate to sharing space between people cycling and walking. However they will be handing out free stuff. Expect to be berated for cycling without a helmet and be encouraged to let your 8 year old child “share with care” with big lumbering HGVs or aggressive parents late on the school run. Nothing about what this charity does is good. They are not trying to enable cycling by campaigning for segregated safe cycle space, they simply want the status quo. 1700+ people die each year due to driver error, over 18,000 are seriously injured, yet we all have the same duty of care. Ridiculous. Still free swag bag. Just make sure not to wear a helmet and make sure to ask them why they are not campaigning for real safety changes by creating space for cycling. A free cycling roadshow will be taking place in Bath next week, helping cyclists get ‘Bike Smart’ for winter as part of UK Road Safety Week 2018. Offering on-site cycle maintenance services, anti-theft cycle marking and a competition to win cycling lights, the roadshow is part of a wider campaign focusing on the safety of those on two wheels. Cyclists and motorcyclists are among the most vulnerable road users in the UK. More than a third of people killed or seriously injured on UK roads are those travelling by bike and more than 100 riders are injured every day in preventable crashes. Probably one of the best explanations of continuous footways that councillors and highways engineers really needs to read. Continuous footway, side-road crossings, simplicity and clarity, blending, getting it right, getting it wrong. What it is which makes the Dutch ‘continuous footway’ design work so successfully? Copies of this are becoming more common in the UK, but are we getting our designs right? What Dutch design principles are relevant here? What can we learn from these principles? What’s wrong with the idea of ‘blending’ designs? 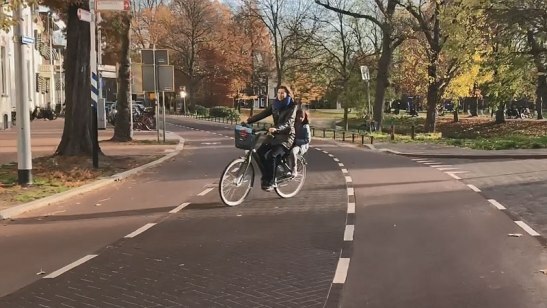 This is, I hope, the first part of what will become a series of articles looking at details of Dutch (and perhaps Danish) infrastructure – specifically at how these support cycling, walking, and the vitality of their cities and towns – and comparing these designs to those in the UK. Details about other posts in the series will appear here. While it is all fresh in my head I will quickly write-up as much as possible. The Bath and North East Somerset Local Cycling Walking Infrastructure Plan is being developed as a whole across BaNES, North Somerset, Bristol, and South Gloucester. It was good to note that Cllr Mark Shelford want a commitment from the people that are developing the LCWIP that the priority would be Safe routes to school then commuter routes to centres of employment, then centre of commerce. Cllr Shelford also noted that walking was analysed at 2km and not the 3 miles that is currently used for school travel support. (5km for cycling). There was an admission that no money is available to implement this and we will be needing to look to the DfT and WECA however WECA are going through the process of developing a Joint Spatial Plan, a Joint Local Travel Plan, and there is also something called the Local Plan. All in all good. What was not so good is there was no connection to what Wiltshire are doing or any detail about the connections between Urban areas. Also Secondary schools were ignored in the node to node analysis in Bath. However expect further work on this. I’ve spoken about these before and there is progress on these with the council now looking to develop or adopt these. They are absolutely vital and can transform what developers can do with their roads space. This is a big big change and will make a huge difference. Apparently £1M is not enough to build a bridge. I understand the one at Batheaston cost £900k with material costs of around £500k. Cllr Shelford made it clear he could not understand why a bridge could not be built here for that money. Expect this one to explode. The ATAF will be developing a set of 7 costed projects to submit for CIL funding via the Bath City Forum. Projects can be as simple as installing a dropped kerb to finally getting a good ramp from the Two Tunnels into Lyncombe Vale rather than that root infested dirt path. Given that other community forums have similar CIL pots, there is no reason not to develop this out to other areas. As cycling has become more popular, so has poor interaction between people walking and cycling. Council is going to reach out to Sustrans and their One Path initiative on the B2B and see if something similar could be done on some of our shared routes. The reality is though, we simply must start designing for cycle traffic and recognise a cycle is a vehicle capable of speed. Grade separated segregated space is realistically the only way to achieve this to remove much of the cycle traffic from leisure routes. Keynsham High Street design process is about to kick off. Western Riverside was discussed and how the whole development should be considered a Low Traffic Neighbourhood and that Destructor Bridge should be restricted to buses only. Further work needed. Weston to City Centre cycle scheme was discussed as to whether the advisory cycle lane actually did anything. A few people noted that if the parking along here was removed then this would no longer be a problem as segregated cycling infra using orcas (see London Road) could be implemented. Cllr Shelford should be congratulated for defending the London Road Orcas. Apparently he got a lot of flack for them. They are an example of how to achieve light protected cycle infrastructure.